Comodo System Cleaner is a powerful suite of utilities and tools that allows you to make your Windows XP or Vista computer faster, more efficient and more secure. 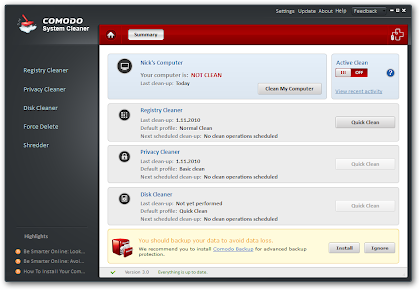 Comodo System optimizes your system performance, clean disk space and keeps system stability with its built in Registry Cleaner and Disk Cleaner tools. Comodo System Cleaner gives you internet privacy by clearing the history, cache and temp files of Internet browsers, instant messengers and Windows applications.